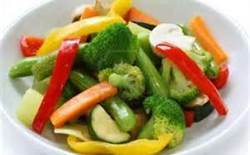 Cook frozen stir-fry veggies in oil until cooked thoroughly. Add the tuna and stir. Add soy sauce and lemon juice and mix in. Cook additional 3 minutes for the tuna to get hot. Wow! Easy peasy, that's for sure! I'll be giving that a try this week. Join in and write your own page! It's easy to do. How? Simply click here to return to Share Your Recipes.